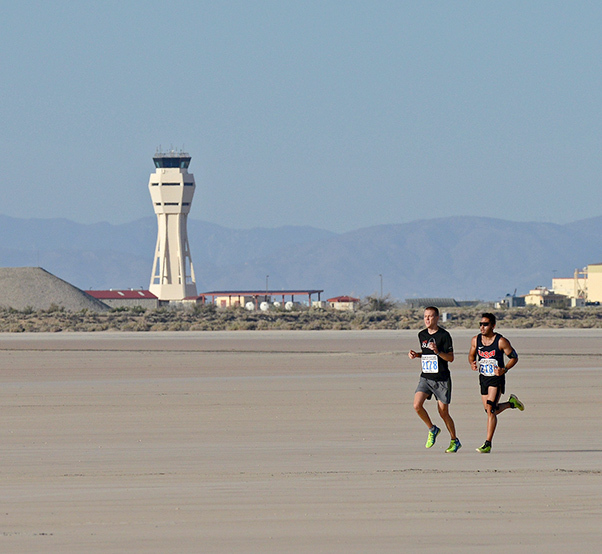 Two runners reach the Rogers Dry Lakebed during the 2014 Edwards Inaugural “Run with History” Half Marathon held May 17, 2015. Edwards AFB will host its second “Run with History” Half Marathon, 10K, and 5K run May 14 at 7 a.m. This non-profit event will be open to the public with proceeds from ticket entries going toward the costs of holding the event. The run will take place on the world-famous Rogers Dry Lakebed and around the world’s largest compass rose. There will also be various aircraft, static displays, historical markers along the route and an exotic car show located at the start/finish area. Don’t miss this historic event … register by April 25! Additional information and registration details are available online at: http://edwardsfss.com and https://runsignup.com/Race/CA/Edwards/EdwardsAFBRunwithHistory. Those interested may also call the base fitness center at 661-275-GYM1 (4961).